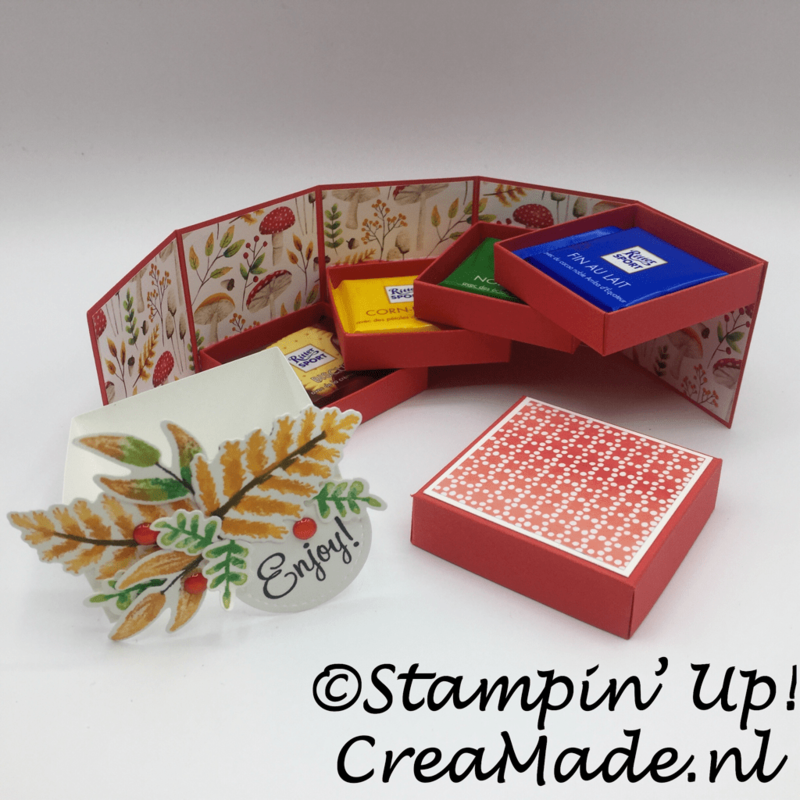 Once in a while our team of stampers the “Stempel Heksen” (Stampin Witches) get to gether to do some stamping and chatting. Of course, I want to make them a small treat box. 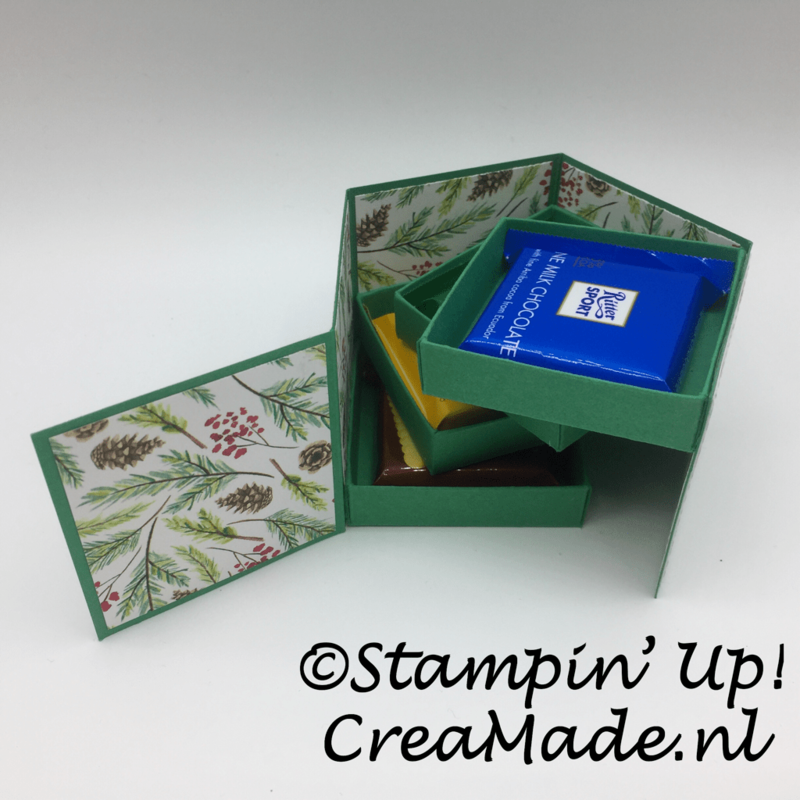 Inspired by the Stepper Box Card by Samantha Clayton from Mixed Up Crafts, I decided to make a mini version. Samantha’s version is a tall box, mine is a square one. 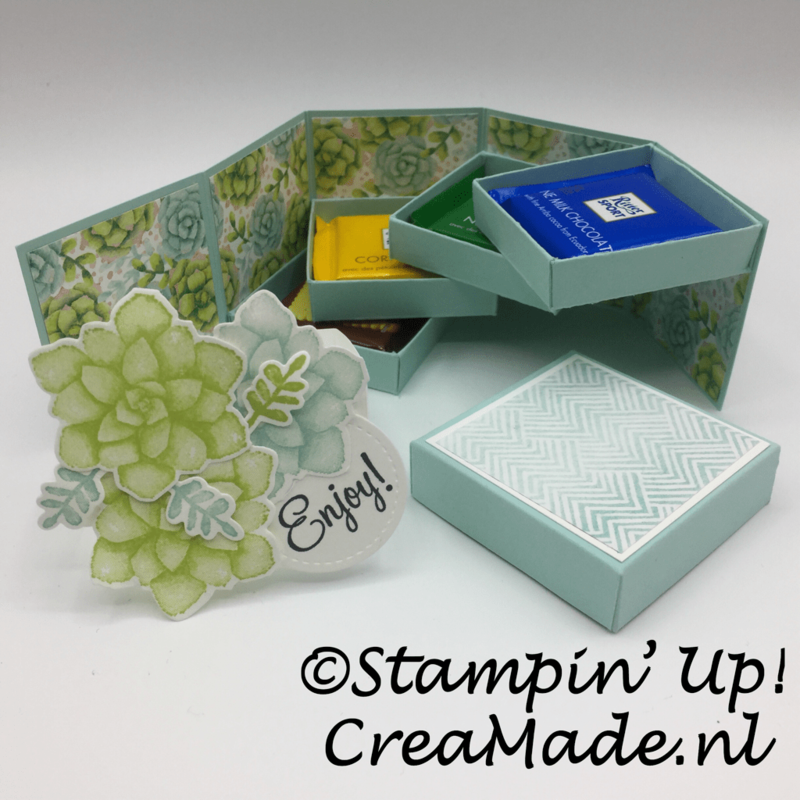 The box measures 2 1/8″ square and the four trayes inside the box are 2″ x 2″ and 1/2″ high. They are made to fit a mini Rittersport. 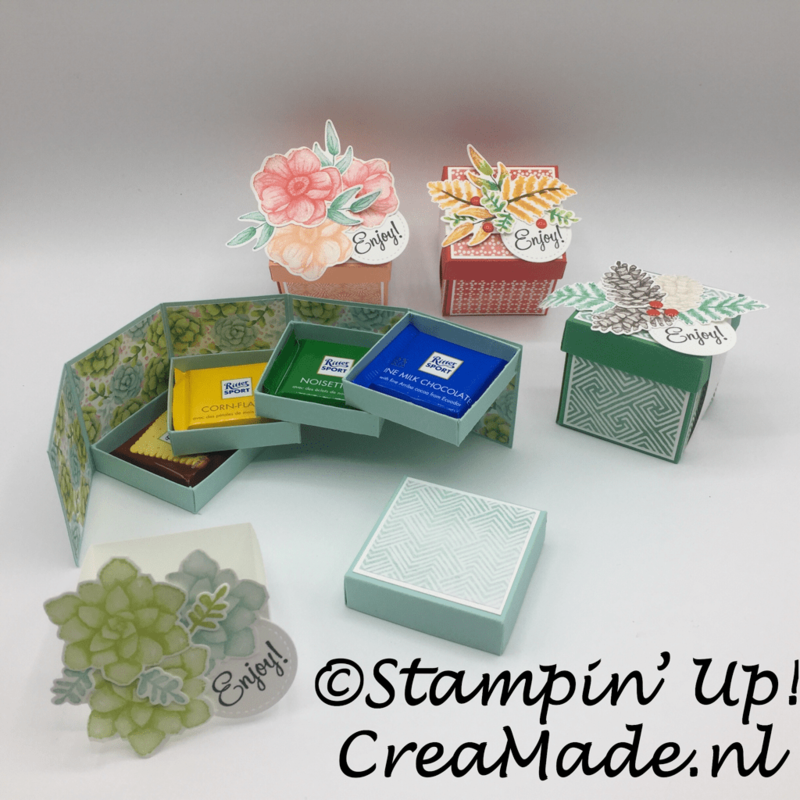 I closely folowed the instructions and I really think my boxes came out perfect. 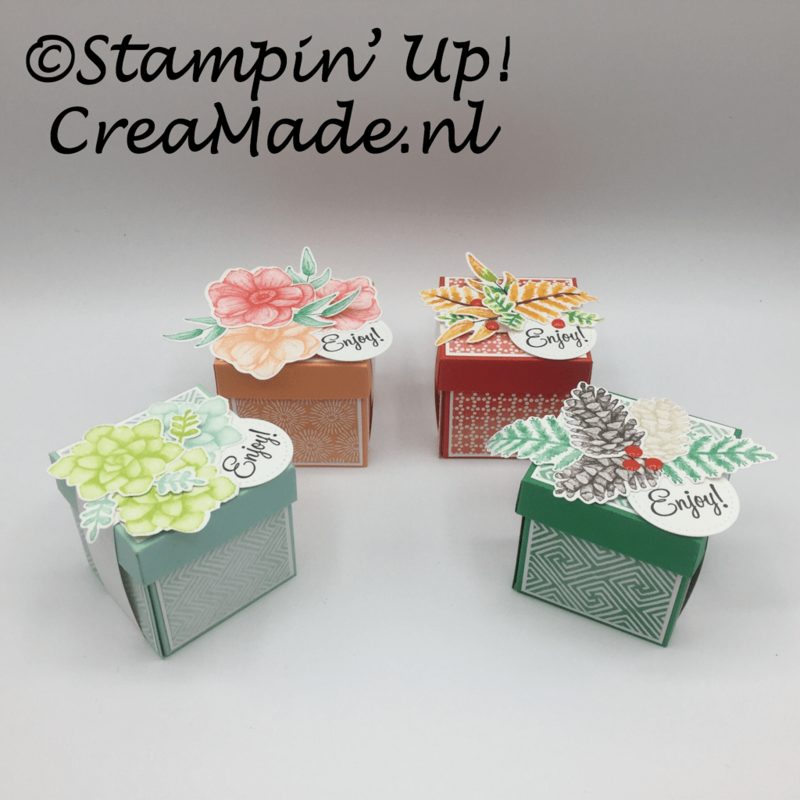 I made four versions using the four designs of the Painted Seasons DSP. One in Pool Party cardstock using the Spring design from the DSP. 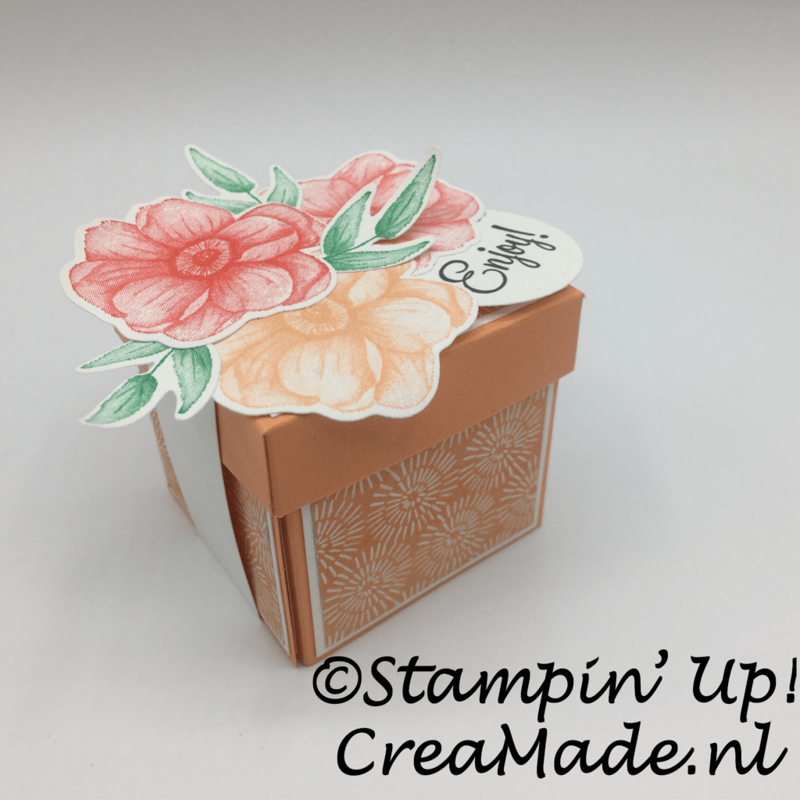 For the Summer version I used Grapefruit Grove cardstock and the summer design of the DSP with the poppy flowers on it. 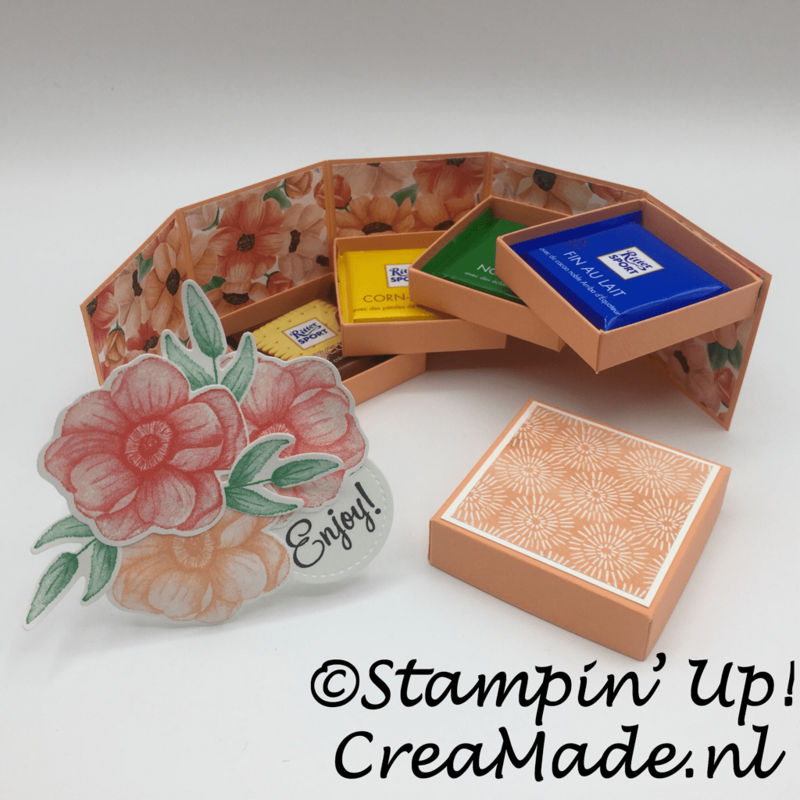 The one made with Poppy Parade cardstock matches the Autumn design of the DSP with the adorable toadstools on it. 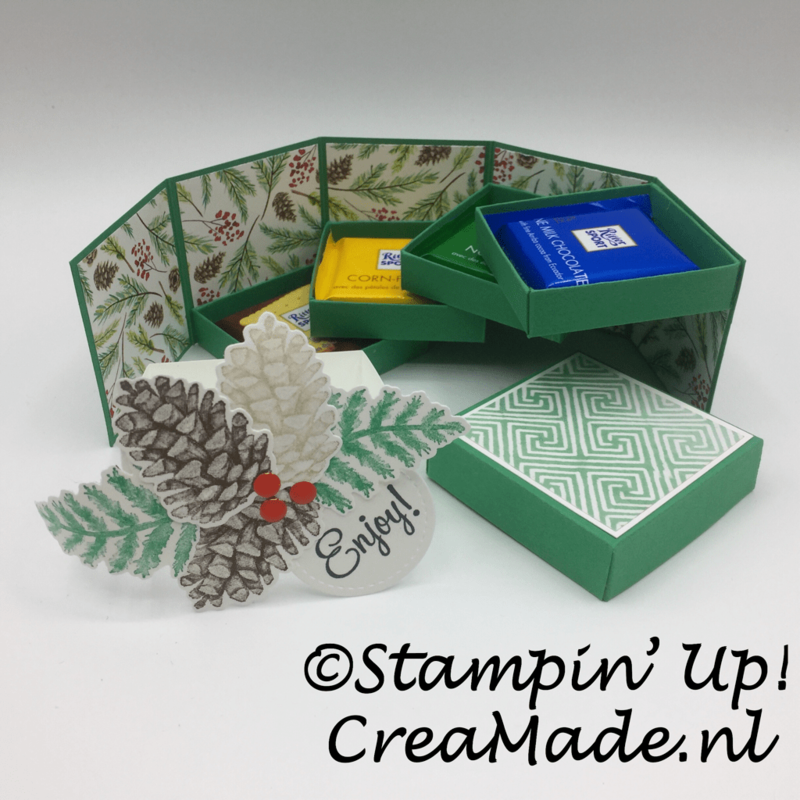 The last one is kind of a Christmas one with the pine cones and twigs in Call Me Clover. 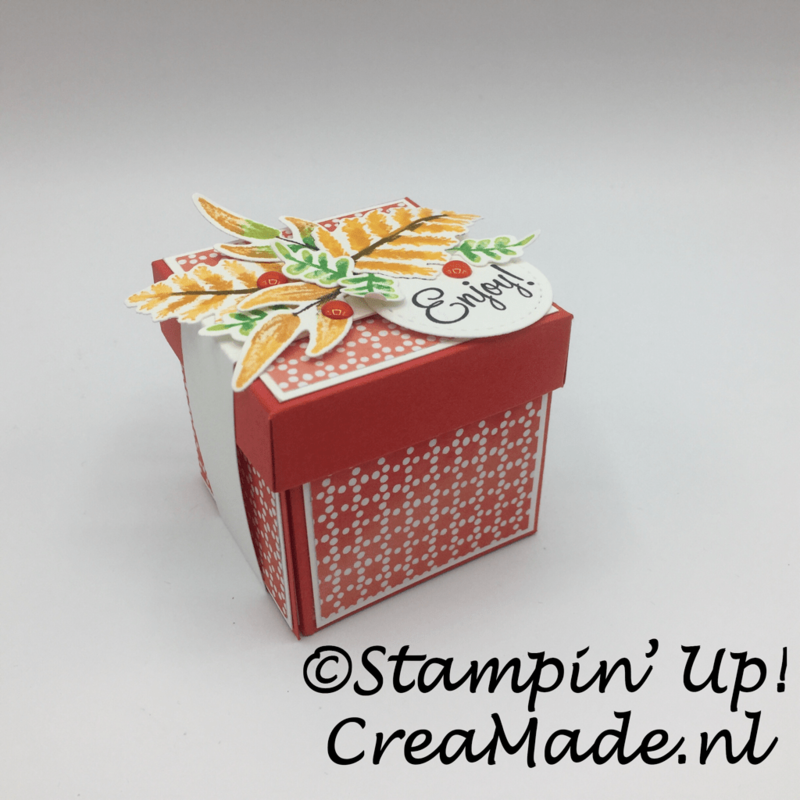 For decorations I wanted to use the Painted Seasons stamps and coordinating dies. 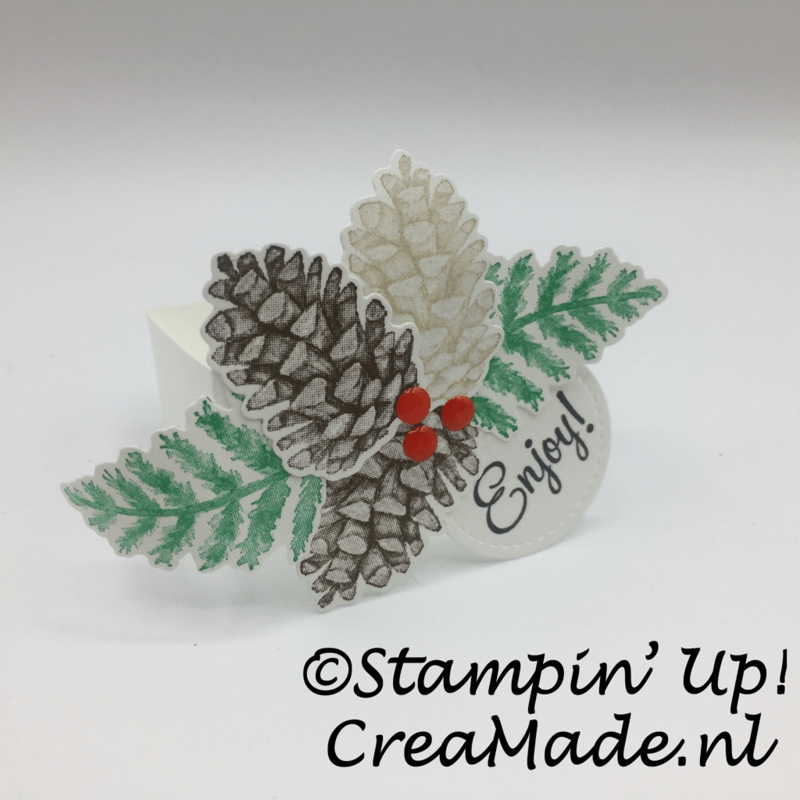 I stamped and die-cut a bunch of flowers, leaves and pine cones. Unfortunately, they are too big to fit on the front of the small boxes. That is why I made a belly band in Whisper White. I decorated the belly bands with thh die-cuts and added a sentiment. 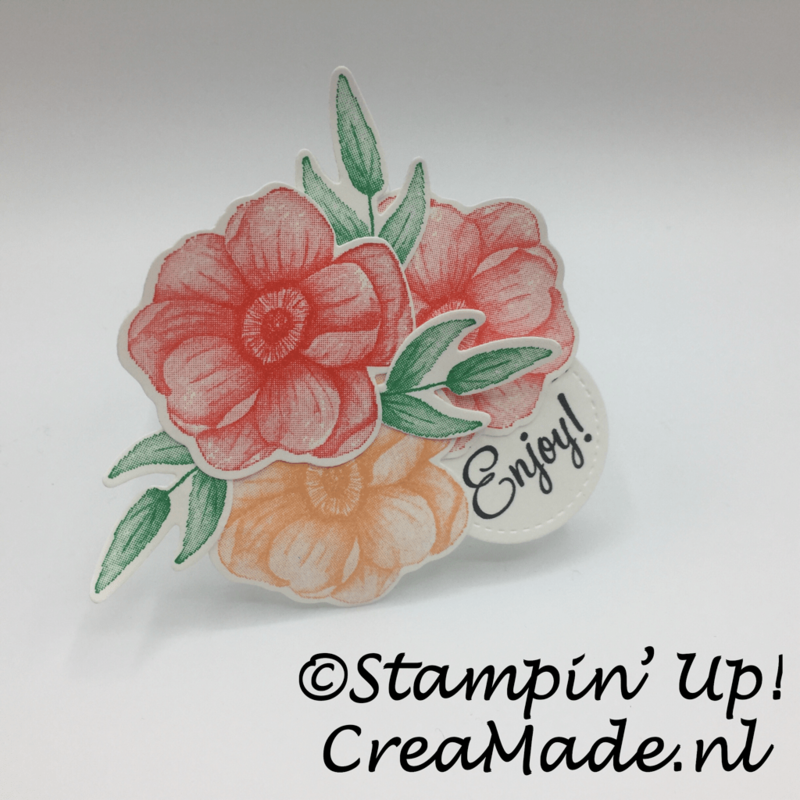 The sentiment is from the stamp set “Dear Doily” and I stamped it on the smallest stitched circle. 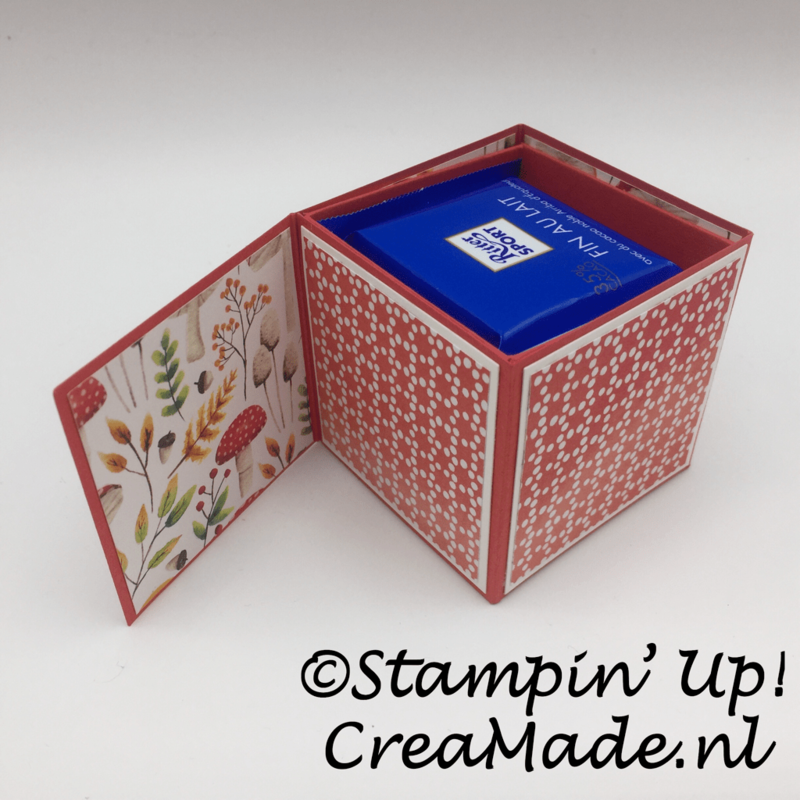 I really liked how they turned out and my stamping friends liked them too.